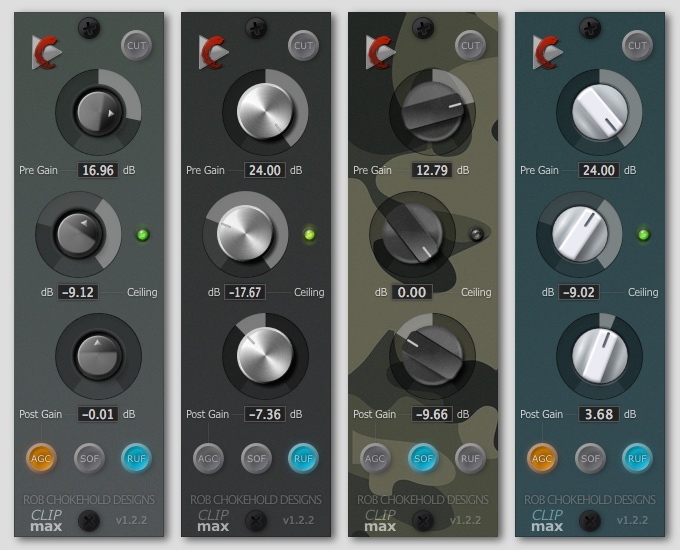 Available as native 32/64-bit AU/VST2/VST3 plugin. Runs on OSX 10.7 or newer and Windows 7 or newer. Installerless .dmg image or .pkg installer for OSX. Currently no Windows installer, .zip file only. Use Pre Gain to tame the signal before it hits the ceiling, or to boost right into it. Set a ceiling value to cut off anything that would peak above it. The more the little LED to the right of the ceiling knob flickers, the more clipping is happening. AGC engages automatic make-up gain calculation. This doesn't just boost everything up to the max, it tries to maintain a fairly natural volume level similar to the un-clipped source. You'll never know what the Cut button does, because you're not a wimp. Right? Clicking the little logo in the top left corner will direct your browser to this product page. The SOF switch will activate Soff (soft) mode. Use Pre Gain to boost into saturation, pretty hard to make this clip. AGC will calculate against Pre Gain instead of Ceiling. I recommend to leave Ceiling at -0 db for Soff mode, or use it very sparingly. A bit mellower high end than default and Ruff mode, works great on guitars or vocals. The RUF switch will put Clipmax into Ruff (rough) mode, this will add a "ceiling before the ceiling" (watch Ceiling knob). The more you lower the actual ceiling, the further down the "soft ceiling" will be extended. Signal that hits the soft ceiling will be re-scaled, similar to compression but on a per-sample basis, so this will sound slightly rough. This will bring down transients but won't sound as metallic as the standard hard clipping, makes a nice shape (pun intended) on bass and also some drums, methinks.